Fifty-one years ago, the Second Vatican Ecumenical Council convened to open the doors of Holy Mother Church to an authentic spirit of renewal in all aspects of Catholic life, including religious and monastic life. The decree Perfectae Caritatis (On the Adaptation and Renewal of Religious Life) teaches that authentic renewal of the Consecrated Life must involve "both the constant return to the sources of all Christian life and to the original spirit of the institutes and their adaptation to the changed conditions of our time." 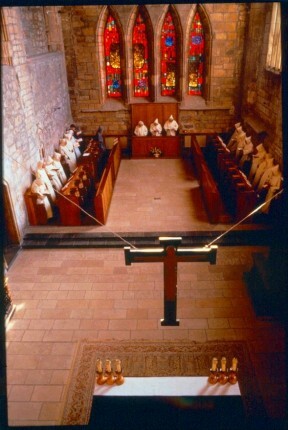 The vision for the community of Our Lady of Refuge Monastery responds to the call of the Council Fathers by establishing a monastic observance which emphasizes an enclosed life set apart from the usual activities and pursuits of most men in order to focus on continual worship, prayer, study, labor, and fraternal charity as taught in the Rule of Saint Benedict. The spirit of this new community will embrace a more primitive observance of the Rule, while at the same time recognize developments in liturgy, culture, and technology since the time in which Rule was composed nearly fifteen hundred years ago. The form of monastic observance will entail what the Church identifies today as "contemplative life" which Perfectae Caritatis encourages and supports: "Communities which are entirely dedicated to contemplation, so that their members in solitude and silence, with constant prayer and penance willingly undertaken, occupy themselves with God alone, retain at all times, no matter how pressing the needs of the active apostolate may be, an honorable place in the Mystical Body of Christ, whose 'members do not all have the same function' (Romans 12:4)." "And so we are going to establish a school for the service of the Lord. In founding it we hope to introduce nothing harsh or burdensome." The word "Monasticism" derives from the Greek "monos" which means "alone." The original Christian "monastics" (men and women) were hermits who fled normal human society to live "alone" with God in remote areas throughout Asia Minor, Africa, and Europe. A purely solitary life proved to be extremely challenging and even dangerous for most devotees, so monastics formed communities, transforming the search for God into a "family affair." Monastic observance was strengthened and enhanced by a life in common where prayer, worship, study, and labor were held together by fraternal charity and mutual support in this richly spiritual way of life. Monasteries became ideal local churches, where Christian life could be observed in a more intense form, away from the many distractions of common human society. By "leaving" the world, monks and nuns place themselves at the very heart of it, engaged in a continuous cycle of worship and prayer throughout the day and night for the needs of the Church and all of humanity, particularly for its great spiritual hunger. The life at Our Lady of Refuge Monastery follows the spiritual doctrine taught in the Rule of Saint Benedict written in the Sixth Century A.D. The passage of time has rendered some details and practices obsolete, however the teaching of the Rule regarding obedience, humility, the primacy of the "Work of God," discretion, moderation, and the supremacy of fraternal charity are ageless. Canon law and other regulations of the Roman Catholic Church establish the framework of all religious institutes of the "Consecrated Life." Our community is governed by the Constitution of the Benedictine Subiaco Cassenese Congregation and our day-to-day customs are guided by our own "Book of Customs." While we may continue to observe whatever customs are still feasible today, we make it a priority to reflect, above all, upon the authentic spiritual tradition of the Holy Rule, which is read daily in community in brief segments so that it is heard in its entirety three times within a year. Enclosure. As directed in the Holy Rule, we observe certain practices that maintain a definitive separation from the outside world as much as is possible. The separating grille in the church has both a practical and a symbolic purpose in witnessing how our community has withdrawn from the world to worship and pray on its behalf. Locked doors, gates, walls, and fences secure the areas on the monastery property that are used exclusively by the monks for work, meals, and other normal activities out of the sight and interaction of guests. Unless necessity or other compelling reasons demand otherwise, monks remain on the grounds of the monastery, not leaving it unless permitted or directed by the Superior. We do our best to provide guests with suitable accommodations and welcoming areas outside the enclosure so that all visitors are well cared for without compromising our cloistered life. Life in Common. Solitude and silence do play a significant role in the monastic life, but such values are never as important as fraternity. The monastic community is a family and the Superior is the father of that family. No matter how good each monk may be, none of us are angels, and sanctity is not an automatic gift. All that we do here is carried out within the context of the common good and fraternal charity: prayer, study, labor, and the daily struggle on our journey toward God. Community life is our greatest cross and our greatest blessing. By doing our best to be present in a timely fashion at the liturgy, at table, and community recreation, we are lending support and encouragement to one another. Community life is never easy, but it is a great grace, and vital to a wholesome life in holiness.